Derbyshire Pilates – Plan an adventure and make it happen!! Life is about creating yourself, identifying the key changes you need to make right now can bring you closer to fulfilling your potential. Exercise is not about the latest trend, its about finding a routine that suits you, that inspires you and enhances both your physical and mental wellbeing. I encourage my clients to take an holistic approach to exercise to get the best results. Find professionals who are passionate in helping you to achieve your goals by taking a balanced approached to your training and recovery. 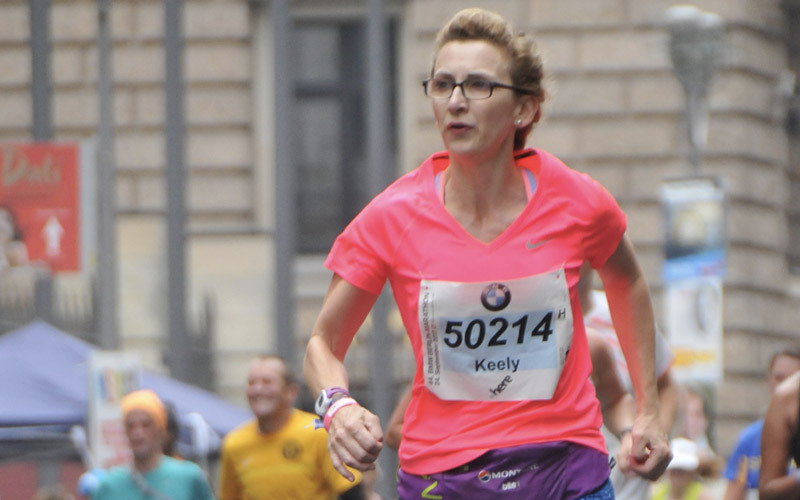 If your dream is to run a marathon, read on and let Keely’s journey inspire you to get started and make it happen. I am still in a state of awe and wonderment – I have just completed my first marathon! The story begins back in January 2016 when I was a ‘fair weather’ runner, only running when the sun was shining and never further than 5k. With the encouragement of my sister who was training for a hill run, I started to push myself a little and set myself a goal of taking part in the Derby 10k in April. I followed a training plan and, to my surprise, finished the race in just under 60 minutes. This led to the desire to run a few more 10k races that year and in October I even ran a half marathon. I realised then that I had caught the running bug! Amid all the New Year resolutions for 2017, I wanted to plan an adventure or a challenge for the year ahead. I bravely (! ), maybe naively (! ), decided to combine the two and signed up to enter the Berlin Marathon. It was indeed going to be a serious mission if I wanted to accomplish it! I sourced a renowned training plan and set an achievable finishing time so that I was not overtraining, undertraining or pushing my body beyond it’s limit. One of the key aspects during my training was to have regular visits to various local health professionals to ensure that I was taking care of my body (particularly my legs!) and for their expert advice to help prevent injuries. I have been a client of Bridgette’s for many years and I have a great respect for her knowledge and experience. Throughout my training she gave me careful guidance to make sure that I was physically able to complete the marathon by showing me the Pilates moves and stretching that I needed to do to help my body recover from the long runs and to prepare it for those ahead of me. Having diligently followed the training plan and Bridgette’s programme, on 24th September I stood with almost 40,000 people on the start line of the Berlin Marathon knowing that I had done as much as I could to give myself the best chance of finishing the race. My longest training run was 16 miles which was the furthest I had ever run. The marathon is 26.2 miles – a substantial distance more! I had no idea what to expect and so I just set off at a steady, comfortable pace and stuck with it. Throughout the run I had total self-belief. My legs were moving easily and my breathing was controlled. I also had 26.2 miles of distractions. There were supporters along the entire route – young, old and every age in between. Some images will stay with me for a long time – the toddler sat playing his xylophone while his mum banged a make-shift drum; the old man sat in a chair, clapping and smiling; residents on their balconies cheering – all of them out in the drizzly weather to encourage the runners. There were countless bands playing all varieties of music to keep us entertained. Drumming bands, brass bands, rock music, pop music – there were even didgeridoos!